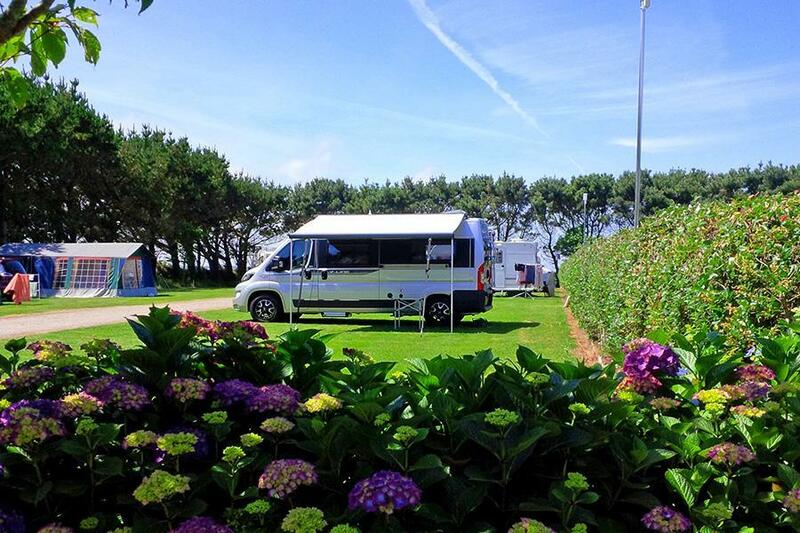 Camp for €18,- a night at Porthtowan Tourist Park in low season with CampingCard ACSI. Porthtowan Tourist Park, located in Porthtowan (Cornwall), is a campsite with 72 touring pitches and 8 year round pitches. With your CampingCard ACSI you can camp on one of the pitches during the following periods: 01-04-2019 - 30-06-2019 and 01-09-2019 - 12-10-2019. At this campsite you can not only use your CampingCard ACSI for inexpensive camping, you can also use your ACSI Club ID (as an alternative ID). Quiet family site with spacious level pitches, clean modern facilities. Surrounded by fields, situated on the outskirts of the village. Close to one of the best surfing beaches, the South West Coast Path and the Coast to Coast Cycle Trail, only 13 km from Truro. Unit: Touring Caravan. Very quiet and nearly empty site (stayed 6 nights in mid July) so had a choice of pitches even though one had been allocated when booking in on the phone. The site is very flat, with very generous pitches mostly on grass with a few fully serviced pitches on gravel, and there is a lot of screening with hedges and trees between different areas of the site. The flower and shrub planting was beautiful and is a credit to the owners. Very friendly and helpful reception from the wardens when we arrived who walked the site with us when we were choosing a pitch and made suggestions about sun and shade possibilities. Toilets and showers were in first class condition - nothing missing or broken, and were always spotlessly clean. Showers are push button but not a problem to use. Childrens play area looked good but there were next to no children on site during our stay. Great idea in the recycling area where you could leave your unwanted kit, and/or pick up something that might be useful for your tent or van. Didn't try the Unicorn pub in Porthtowan because it seemed a bit scruffy with some work in progress, but on a recommendation from the owner we tried the Victory at the top of the hill on the way to St Agnes and found it to be a lovely little traditional pub with nice food and a small beer garden. Can definitely recommend this site and would go again. CCA-price was lovely. Would you like to book Porthtowan Tourist Park or request more information? You can do both using the information below. A30 Bodmin-Penzance, take the Porthtowan turning. Cross over the A30 and continue as far as the T junction through North Country. Turn right after 750 metres, campsite on the left. CampingCard ACSI will send your information request to "Porthtowan Tourist Park".